Keith began his glassblowing career in 1994 at Virginia Commonwealth University in Richmond, VA where he earned his BFA in Crafts with a focus in Glassblowing. 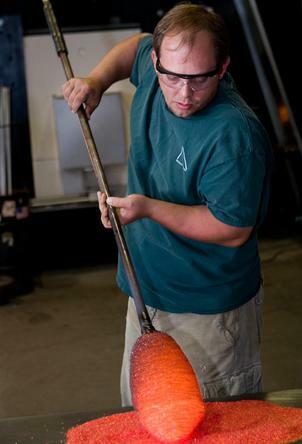 While he was earning his degree, he worked for the Williamsburg Glass Company where he experienced all aspects of a glass shop; from blowing in the hot shop to grinding, polishing, cutting, mixing batch and finishing glass in the cold shop. It was there that he developed respect for the art of production and the Early American glass techniques developed in East Coast factories. 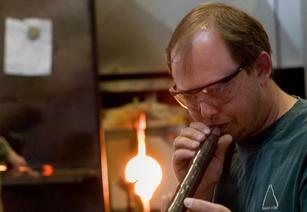 He then began working in various west coast states as a glassblowing instructor, gaffer and casting lead crystal. He also discovered a passion for technical work while employed at an aerospace company. He settled in Seattle, Washington in 2003. He resumed teaching glassblowing classes and assisting at Art by Fire while living, assisting and gaffing at Blowing Sands Studio with David Smith. Wanting to expand his knowledge and experience in all aspects of glass while pursuing knowledge about the operational aspects of a studio, Keith took a job as the studio technician for The Glass Eye Studio. He later left to become the lead hot shop technician for Tacoma’s Museum of Glass and Contemporary Art. He was responsible for maintaining all aspects of the museum’s hot shop, working with every visiting artist and teaching glass work to the museum’s donors and sponsors. Keith felt ready to get back to creating his own glass and in 2006 he became an owner at Gathering Glass Studio where he uses his skills as a technician and glassblower to both teach various community members and to create new and innovative product lines while working with his wife Stacy Gabor. Contact us with all your questions!